Laksa soup, originally uploaded by oliverkhaw. This Indian chap can be found outside of Prima Tajung in Fettes Park, Penang. Perched on the back of his motorcycle will be a selection of the most tempting deep fried snacks like the pohpiah/spring roll, samosas, taukua and nonya cakes. 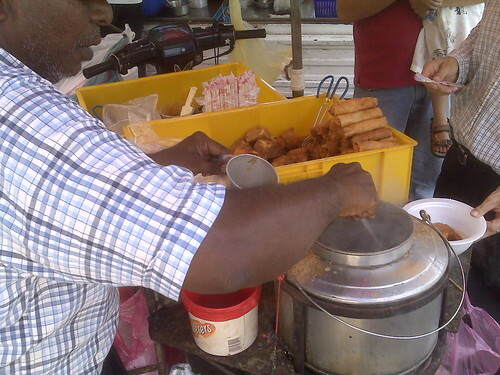 He also serves laksa from a small modified charcoal stove hanging off the back of his bike and while there are better tasting laksa places in Penang, you just can’t beat the experience of tucking into a bowl of laksa by the road and dipping cruncy spring rolls into the soup to finish off. An excellent roadside snack by any standards. Just mind the cars whizzing by when you’re enjoying your snack. Jokbal shop, originally uploaded by oliverkhaw. This is the shop where we had our mouth watering jokbal in the previous post. 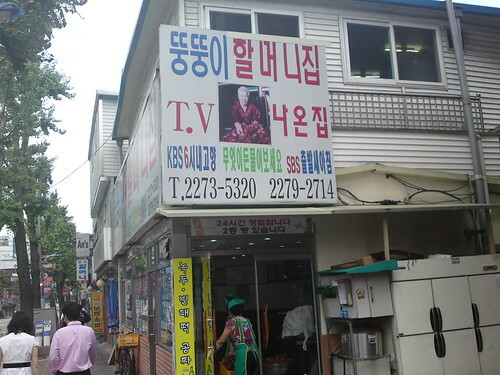 The famous and “original” Fatty Grandma Jokbal Shop. You’ll find the grandma in the picture sitting at the cash register everyday to lend authenticity to the premises. 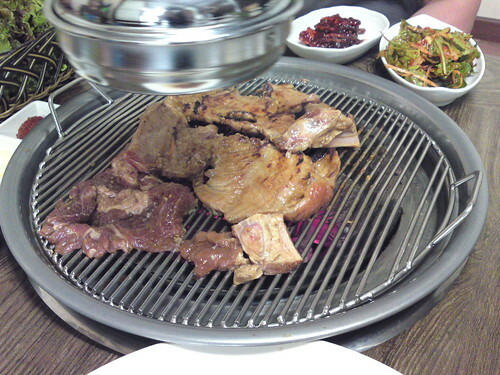 족발, originally uploaded by oliverkhaw. While on the bus to Cheonggyecheon (청계천) in Seoul we came across a row of jokbal shops in the Jangchungdong area and just had to get off the bus to sample. But when the bus actually stopped, we were almost 2 kilometers away. As taxis would refuse to travel such a short distance and we were not in any physical condition to walk back after having toured Seoul the entire morning, we took the subway and ended up having to change trains just to get to within 100m of those shops! Oh boy, was it worth it. Pigs’ feet simmered in a stock of leeks, garlic, ginger, rice wine and herbs until the meat is tender. It’s then ‘deboned’ and then sliced and served with accompanying lettuce and perilla leaves and saeujot (새우젓). A lot of you may be squeamish about eating pigs’ feet but this is really a must try. 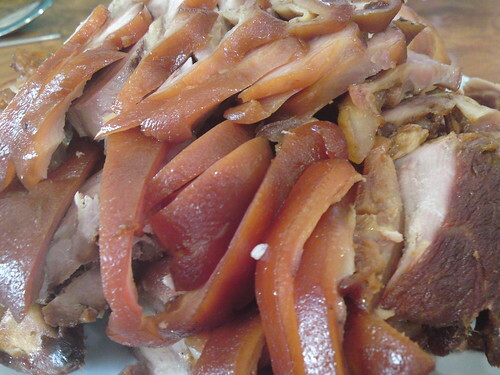 The chewy skin, the melt in your mouth fat and firm meat that has absorbed all the flavours of the stock really takes this part of the pig to a whole new level of culinary experience. After we finished the meat slices, it was time to pick up the bones and gnaw on the meat left on and loads of gelatin. Yummy! It’s difficult to get this dish outside of Korea and when you do find it, they can seldom match up to the original. 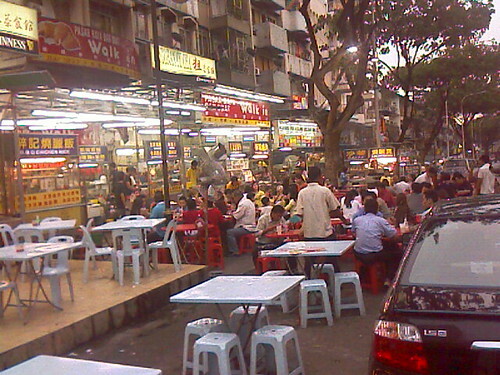 Food stalls at Tong Shin, originally uploaded by oliverkhaw. If you’re not put off by the crowds of people deciding what they want to eat by looking at what you’re eating and the cacophony of hawkers yelling out their specialties, beggars looking for a handout and VCD/DVD selling thugs, this is probably the best place to sample a huge range of Malaysian street food. A must have during any visit of ours would be the roasted Chicken Wings with a honey marinate, stir fried Hokkien Mee (fat noodles stir fried in pork fat, black soy sauce, leafy greens and topped off with a heaping of pork crackling), Curry Chee Cheong Fun with Yong Tau Foo, Pan Grilled Stingray with lashings of chili/sambal sauce and small packets of Nasi Lemak. This is no place for people on diets! 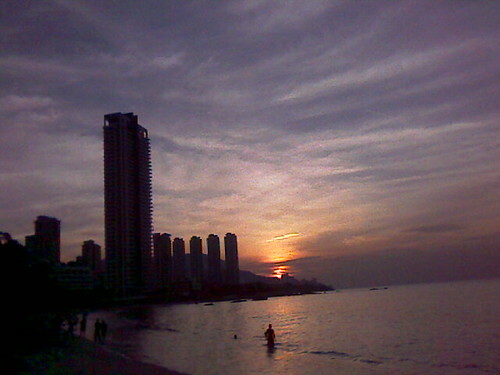 Sunset at Tanjung Tokong, originally uploaded by oliverkhaw. How often do we take our own beaches for granted? We read about all these great seaside resorts in far away exotic islands and are bombarded with images of pristine beaches on tv. Have you taken the time to truly enjoy and appreciate nature in your own backyard? We used to pop by the above stretch of sand in Tanjung Tokong, Penang (just behind Naza Hotel and the Penang Chinese Swimming Club) within walking distance from our rented apartment for our daughter to play with the sand and now that I’m hundreds of miles away, I wish I had spent more time there with my family. Octopus & Squid, originally uploaded by oliverkhaw. This was one of the side dishes (banchan) served at the seafood place in Sokcho where they served us the “moving” flatfish sashimi. True to their business model of “any fresher and it’ll crawl off the table”, the contents of this dish was also in full motion with the octopus tentacles still curling itself around my chopsticks and the suction cups attaching the dismembered limbs onto said chopsticks. Dip into a generous helping of Korean chilli paste (gochujang) and pop into the mouth for a culinary experience that is both yummy and freaky at the same time. 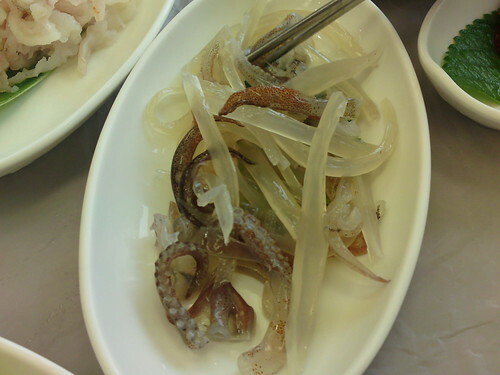 The squid slices were much more sedentary and sweet to each and every bite. Definitely not for the faint hearted. Sashimi sole, originally uploaded by oliverkhaw. Visited Sokcho which is a seaside town in Kangwon Do and about a 2-hour bus ride away from ChunCheon City. It’s a popular destination for summer holidays, especially to the water theme park “Waterpia” (where me, my wife and bro in-law were thoroughly sun burned). On the day we arrived in Sokcho, we followed a cab driver’s recommendation to a seaside restaurant known for sashimi. Actually there was an entire row of restaurants along one of the Sokcho’s coastline selling nothing but sashimi, which is pretty much how things are in Korea. You find one restaurant getting relatively well know for a particular dish and pretty soon you see similar restaurants springing up around it selling the same thing. 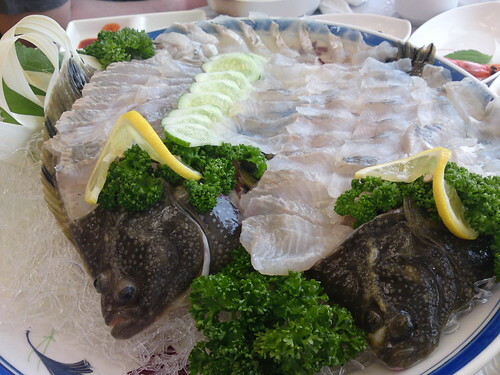 Ordered the sashimi flatfish which was recommended by the proprietress and everyone had a minor heart attack when the fish was still puffing its gills and opening its mouth. While we know this is a simple reflex movement by the fish, it promptly put most of us off eating the sliced sashimi pieces. Wife attempted to cover the head with a piece of lettuce but that sort of made it worse as the whole leaf would be moving up and down each time the fish “moved”. Finally the head and bones were removed to be added to a spicy fish stew that was served up later. Notwithstanding the rather unappetizing fish movements, the cuts were thin and delicate with enough firmness to give the fish slices an amazing texture. It was super fresh and sweet. Charcoal grill, originally uploaded by oliverkhaw. One of the most amazing meals I’ve had in Korea was this medium sized restaurant located in ChunCheon City (about 2 hours’ bus ride from Seoul and where my in laws are staying) serving charcoal grilled pork short ribs or dwaeji galbi (돼지갈비). The seasoning (usually consisting of soy sauce, garlic, sugar and fruit juices) was absolute perfection and the charcoal stove just infused the meat with the most amazing aroma. Best eaten while wrapped in either lettuce or perilla leaves with a slice of fresh garlic and dipped in either ssamjang or gochujang. Simply heavenly. As in any typical Korean meal, it was accompanied by loads of side dishes (banchan) and this particular galbi house served an equally amazing marinated chilli crab banchan. While ChunCheon is more well known for Dak galbi (닭갈비), i.e. the spicy chicken version that was created in the city itself, this dwaeji galbi is simply better than many other galbi houses in Korea that I’ve tasted.